It’s one of those very nice to have things when the weather gets cold of the seas rough. We thought we would have one, but Darryl the Dodger Dude didn’t come through. Now I refer to his as Darryl the Damn Dodger Dude or DDDD. He made the pattern in February and the first thing I learned was that he never came to the boat when he said he would. But I had been warned that he was slow, but always got the job done. As our departure got closer I called him regularly and suddenly I couldn’t reach him by phone so I switched to Roberta’s. About 2 weeks prior to our departure DDDD said the dodger was done so I pressed for a delivery date – refer to first lesson learned. Next his story was it was done but he couldn’t find it – he works out of a shed behind the house. I’m glad we didn’t pay him anything up front. As we’ve been traveling we been looking for someone to make our dodger and here in St Augustine we found someone who would do it in a week – thus our extended stay. We had our first, almost serious injury, on the boat yesterday. 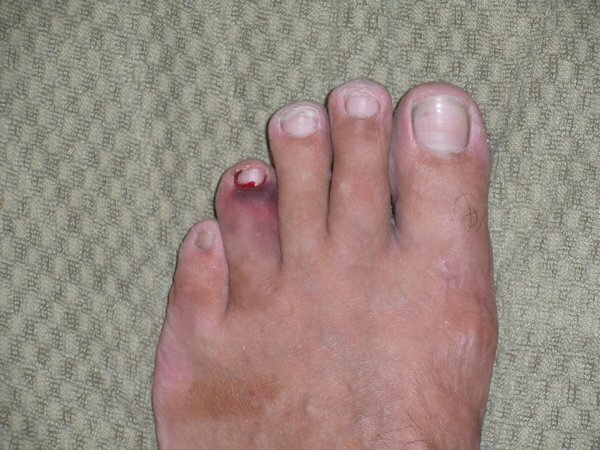 I caught my toe, ok stubbed it, on a cockpit cushion. Yes a cockpit cushion and it hurt so stop laughing. When sailing I always wear shoes, but at anchor not so much. I was climbing into the cockpit and somehow caught my toe and both Roberta and I heard it crack. After I finished my stubbed toe dance, I checked out my toe – it seemed alright so on whet the shoes and I continued on. Ok so it’s an old joke, but here’s the damage a cushion can do.